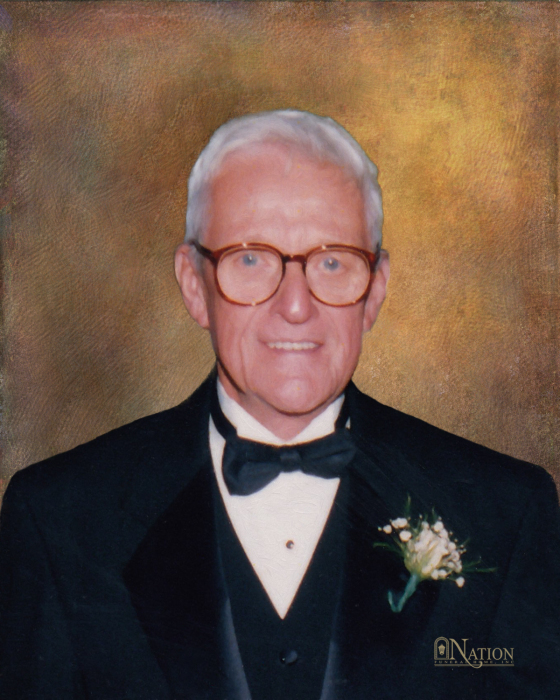 F. Patrick “Pat” Meehan Jr. 95, of McDonald, South Fayette Township, died peacefully in his home on Saturday, February 2, 2019. He was born January 28, 1924 in McDonald; loving son of Francis Patrick Sr. and Bernadette (Baiers) Meehan. Pat Meehan was a graduate of McDonald High School and was a WWII veteran serving in the Army Air Force. He worked for US Steel in Pittsburgh as a safety manager where he retired after 20 years. Following his retirement, he worked at Nation Funeral Home as an assistant for 25 years. Throughout Pat’s life he devoted his time to his church and family. He was a long time devoted member of St. Patrick R.C. Church in Noblestown. He also was a member of the McDonald VFW and enjoyed cutting grass. Cherished husband of Pauline for 71 years. Loving father of Pat (Dorothy) Meehan III and Maureen Meehan; beloved brother of Mike Meehan and the late Mary Lou Howells; cherished grandfather of Patrick Meehan IV; and great-grandfather of Sean, Shannon, Aidan and Torin Meehan. Family will receive friends Tuesday, February 5, 2019 from 2-4 and 6-8 pm at Nation Funeral Home Inc., 220 E. Lincoln Ave., McDonald. A Mass of Christian Burial will be celebrated Wednesday, February 6, 2019 at 10:00 am in St. Patrick R.C. Church, 7322 Noblestown Rd., Oakdale. Entombment will follow at Queen of Heaven Cemetery in McMurray. Memorial contributions are suggested to St. Patrick R.C. Church.